Do you entertain friends for the big game day? So do I, and I am always looking for new ways to delight my friends with recipes that I have not served in the past. This year I will treat them to this easy football cheese ball. I can’t wait to see them dig into it! Who would have thought this football started with packages of cream cheese? 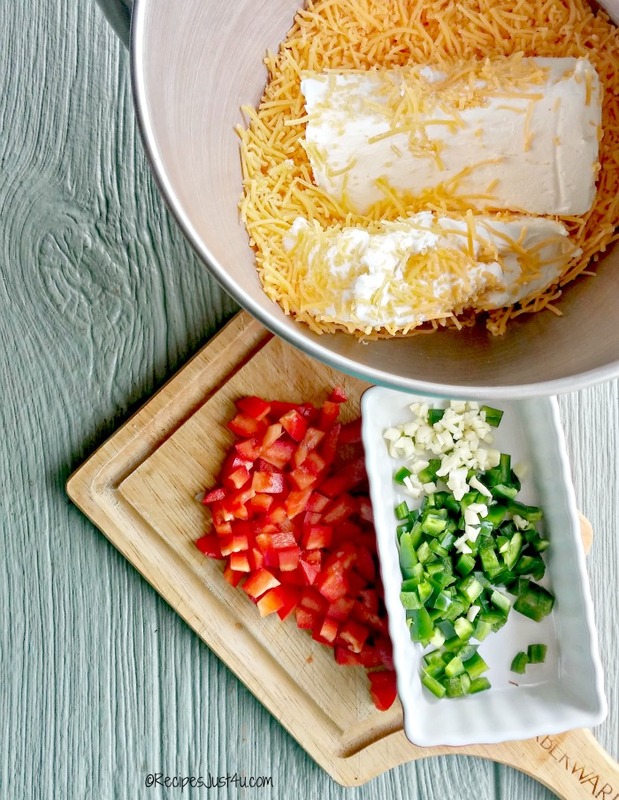 The recipe is one of my favorite easy appetizers for game night. This shop has been compensated by Collective Bias, Inc. and its advertiser. All opinions are mine alone. #ScoreMoreFans #CollectiveBias It’s time to make a football cheese ball! 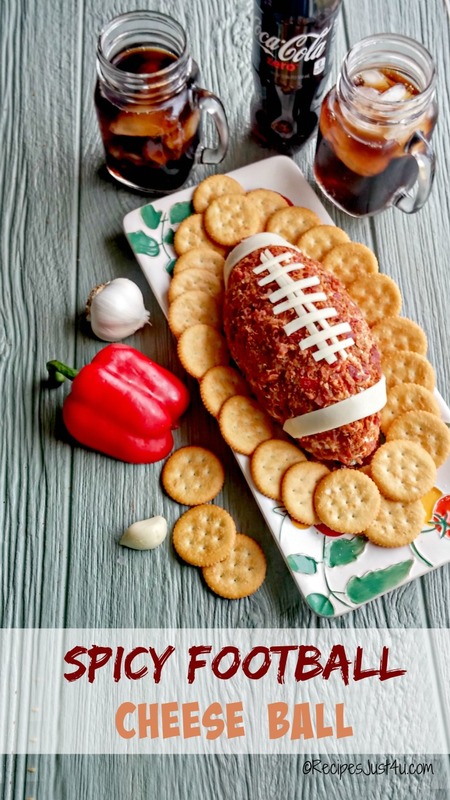 Delight Your Friends for the Big Game Day with This Easy Jalapeño Spiced Football Cheese Ball. Cream cheese balls are one of my favorite appetizers to prepare. And since my guests also love spicy food, I decided to amp up the heat for this recipe with the addition of some diced jalapeño peppers. I love the simplicity of this recipe. Just a few ingredients will come together for a great tasting party appetizer that your guests will love. When I am having guests for a TV big game night party, I want to make sure that the food I serve is very easy to make. 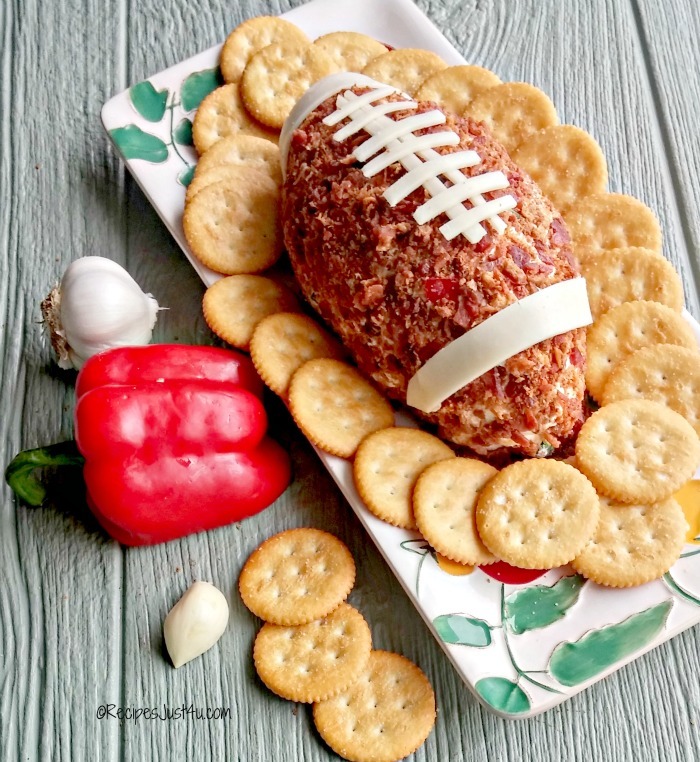 But I also like to throw in a bit of creativity, so making this cheese ball in the shape of a football really appeals to me, and I know my guest will think it’s great too. 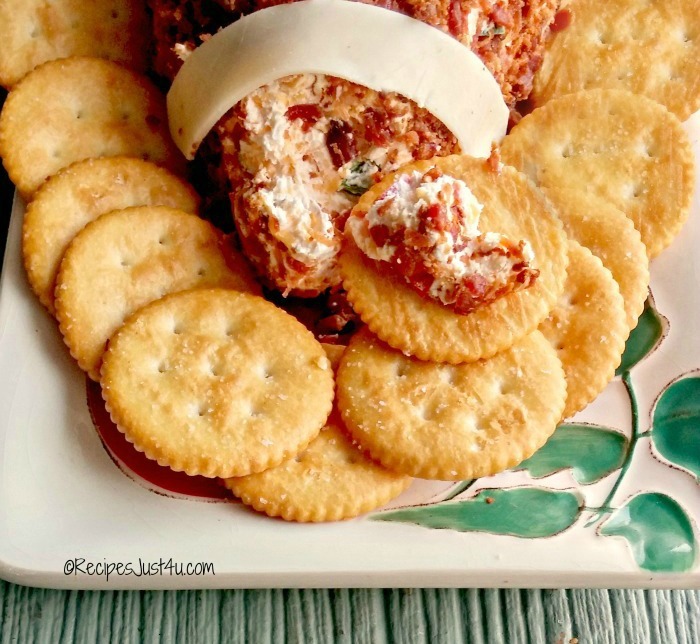 My choice of cracker to serve with this cheese ball are the RITZ® classic crackers. Perfect! These bite sized bits of crunch are so tasty and perfect for dipping into this delicious cheese ball. Making the cheese ball is a cinch. 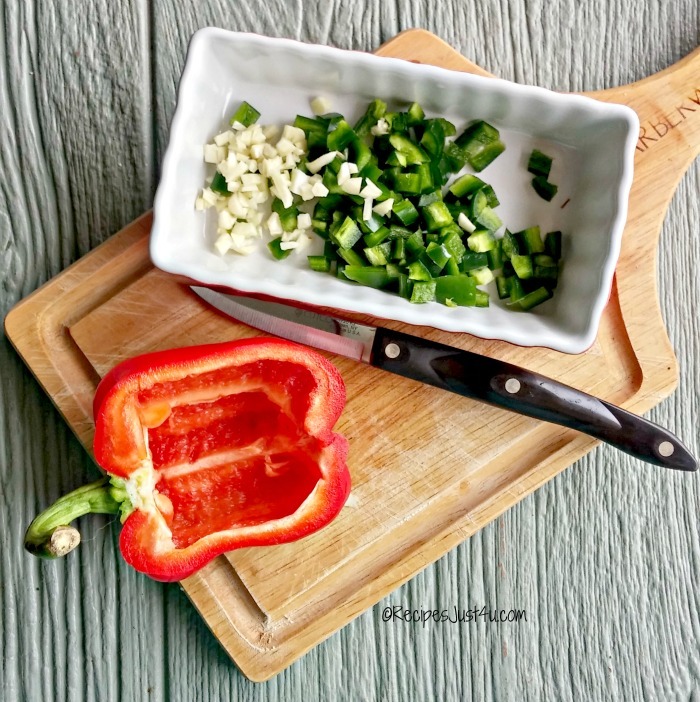 Start by dicing your peppers and garlic. I removed the seeds from my jalapeño pepper. If you like the cheese ball more spicy, just leave some (or all – you spice fiend, you!). Everything just gets combined in a large bowl, (I used my stand mixer) except for the bacon. It mixed together easily, but a hand mixer will work too. 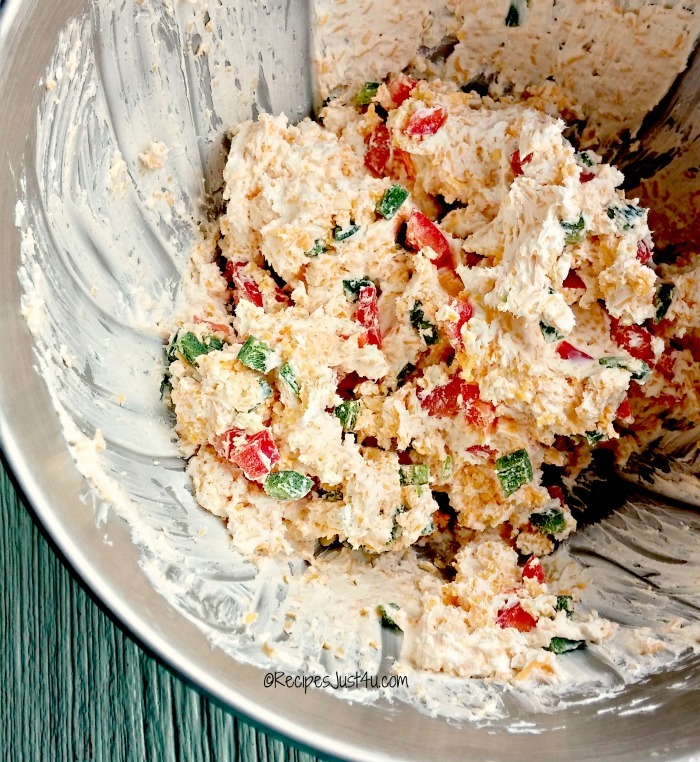 Just be sure that you start with very soft cream cheese to make it easy to mix. Mix well so that the peppers and garlic are well combined. Scrape down the sides of the bowl a few times too. 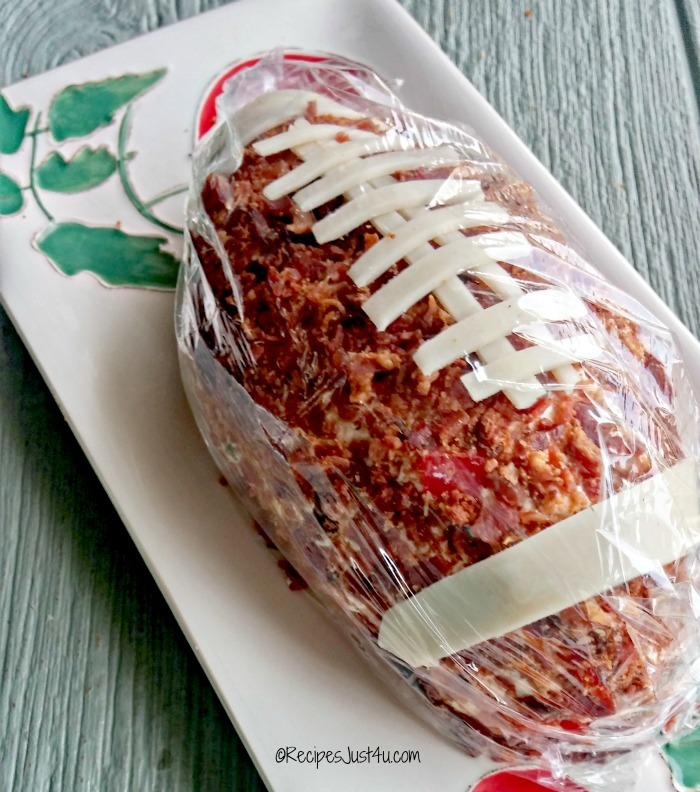 Form the whole thing into a football shape and wrap in plastic wrap and put it in the fridge for several hours so that it will set. I just added a bit of oil to my hands to form it and it actually formed very easily right after I mixed the ingredients. I love that you can make this football cheese ball ahead of time, even days before, since it will keep for about a week in the fridge. Just take it out the day of the gathering and coat it with the bacon bits and add some mozzarella cheese strips to resemble the lacing on a football. I used two wide strips of white cheddar cheese to make the end decoration on the football. I stuck them to the cheese ball but just putting a small amount of the cream cheese on the back of the strips. For the laces, I used two long pieces for the seam and 8 shorter pieces for the laces and laid them on the top of the cheese ball. This football cheese ball is so neat looking on my long platter surrounded by the RITZ® crackers in the shape of a football. Coke Zero adds the perfect drink to go with this appetizer without adding any extra calories. Win Win. I love to serve the Coke Zero in mason jar mugs for some extra fun atmosphere. It adds to the casual party theme we have going on for the big game. Walmart has a special promotional offer going right now too! 2 for $5 on all Coca-Cola 500ml 6-packs!! The football cheese ball is creamy, spicy and so, so tasty. It’s the perfect appetizer to sit on a coffee table while you all watch the game on TV. Appetizers are the perfect food for a party like this and this one is one of the neatest ones I have ever made. You should have seen my husband’s face when he saw it. He fell right in love with me all over again!! I just know my party guests will love it, too. 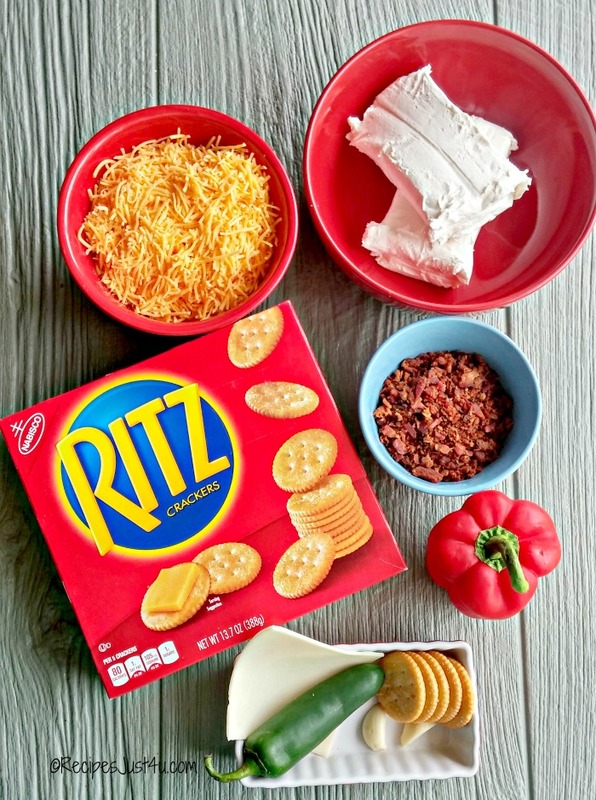 The RITZ® crackers hold the cheese so well, and what could be more perfect on game day than the spicy taste of this delicious cheese ball served on such a tasty cracker? 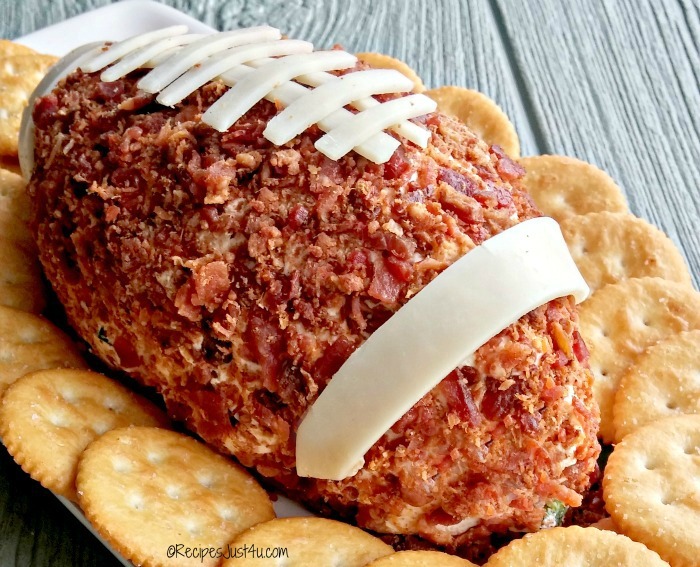 Want to make this football cheese ball recipe for your friends for the Big Game day? Head on over to your local Walmart. 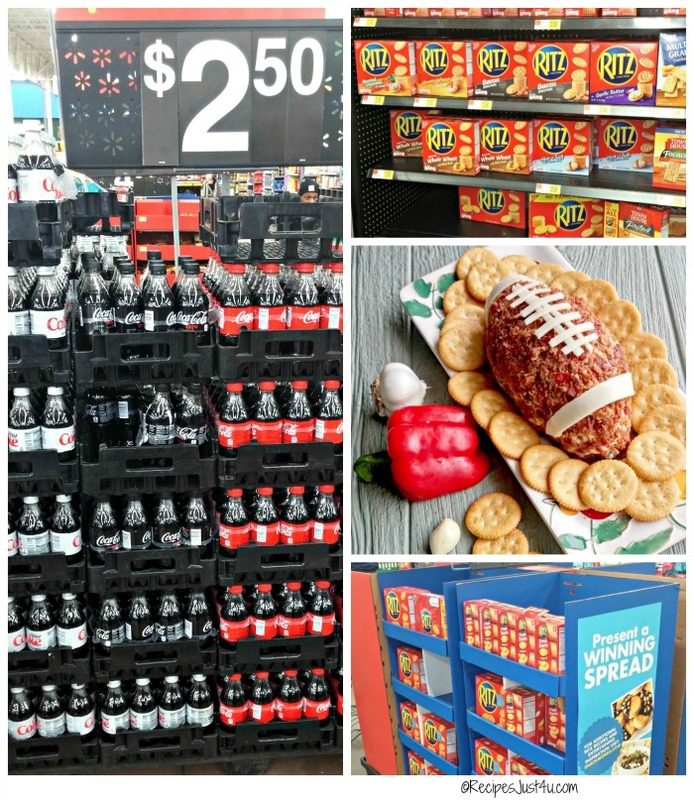 They have a special display that features several varieties of RITZ® crackers, and the Coke Zero is easy to find a special display in the center aisle too. Then go to the diary and produce aisles to gather your other ingredients. 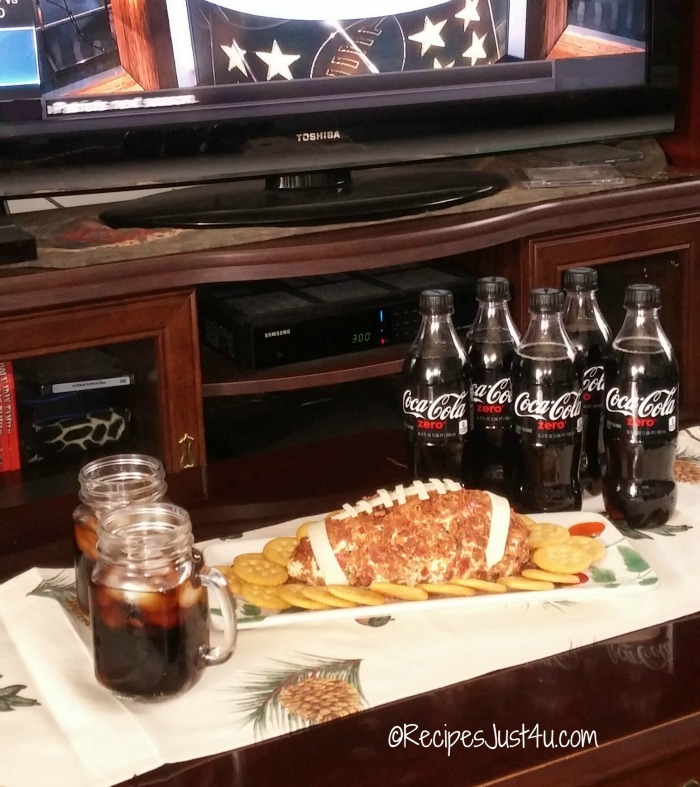 Looking for more football party ideas Coca Cola and RITZ® to have at your house to score with your biggest fans? Check these tasty ideas at Snacks and Sips. What is your favorite food to share for the Big Game? I’d love to hear about it in the comments below. Place a small amount of oil on your hands to keep the cheese ball from sticking to them. 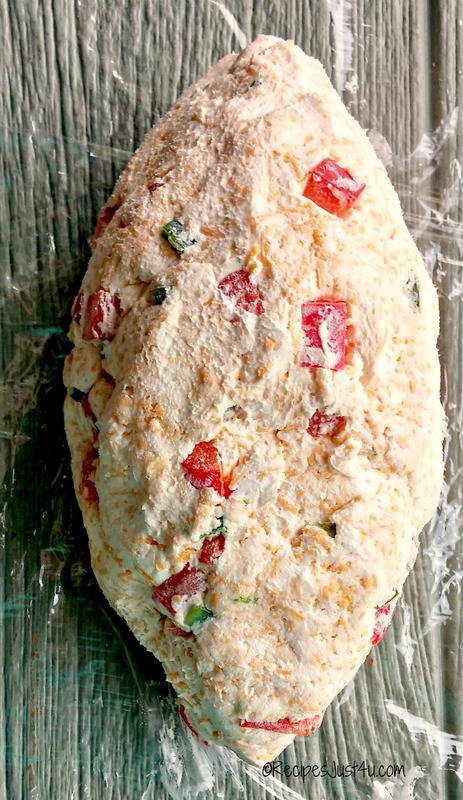 Lay the cheese ball mixture on some plastic wrap. Form into a football shape and wrap with the plastic wrap. Refrigerate for several hours. Remove and coat the outside of the football with the bacon bits. Add strips of mozzarella cheese to form the lacing on the football and two thicker strips to decorate the ends of the football (some cream cheese will help these to stick to the bacon coated cheese ball). The cheese ball will keep for about 1 week in the fridge so it can be made before the party; but don't roll on the bacon until the day of serving. Serve with RITZ® classic crackers. Enjoy! My family likes a bit of spice. Thanks for sharing a dip idea for a party. Mine does too, this was a big hit with them. Carol, I might just have to stick around for the super bowl if this was being served. LOL. It is really tasty! This is so much fun!!! We love all these flavors so I think this would be a huge hit at our house, I will definitely have to try it out for the Big Game this weekend. Thanks Nicole. Our guests really loved the taste!